I don’t rant about everything going on in my life online- usually. I believe it’s been close to or over a month now, but my laptop decided it hated me and died. Maybe I mention this already. BUT That’s the main reason I haven’t been posting lately. Second reason is that I ran out of space on my camera. I did use my friends super nice camera for my last post…(Did I post that pic???) BUT Now he is out of town! More like out of the country. Even if he DID leave it home I wouldn’t dare touch it because if I broke it I’d be paying on it for forever. So right now I’m working on clearing out memory cards and making backups which I estimate will take me 2-3 days because the battery doesn’t last long enough to clear out one memory card. But just to keep you all hanging on I promise the next post will be 2! Right now I’m wearing one of Sally Hansen’s duo chrome from a new line called Lustre Shine, called Lava *drool*. And the other (which of course is on my other hand) is a Maybelline New York Color Show Limited Edition polish called Avante Green. Avante Green is one of those polishes I nearly lost sleep over because I knew the displays wouldn’t be there for long. I’ll give more about that story with the pictures posted! So dearies please hang in there, the wait is going to be worth it. So I recently bought my 1 and 1/2 year old son some super cute pajama’s at Costco with adorable monsters on them! 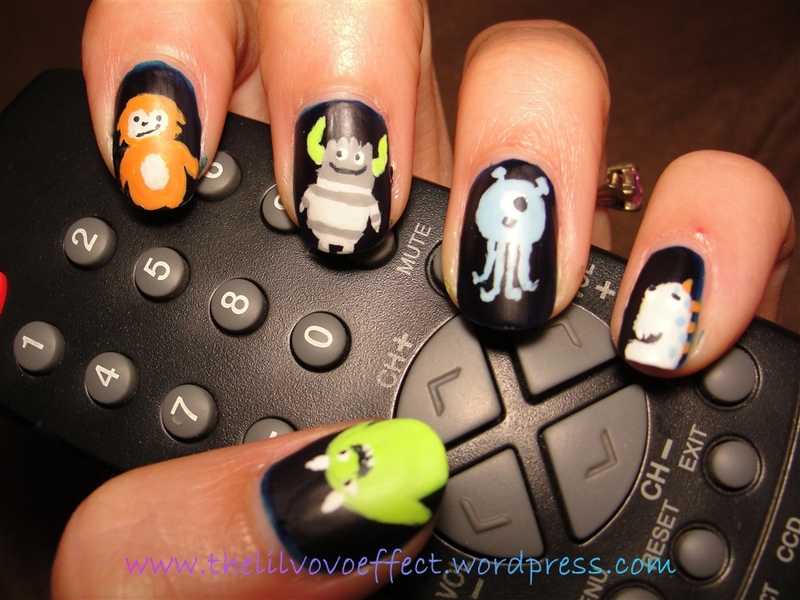 So here are nail inspired by toddler p.j.’s! 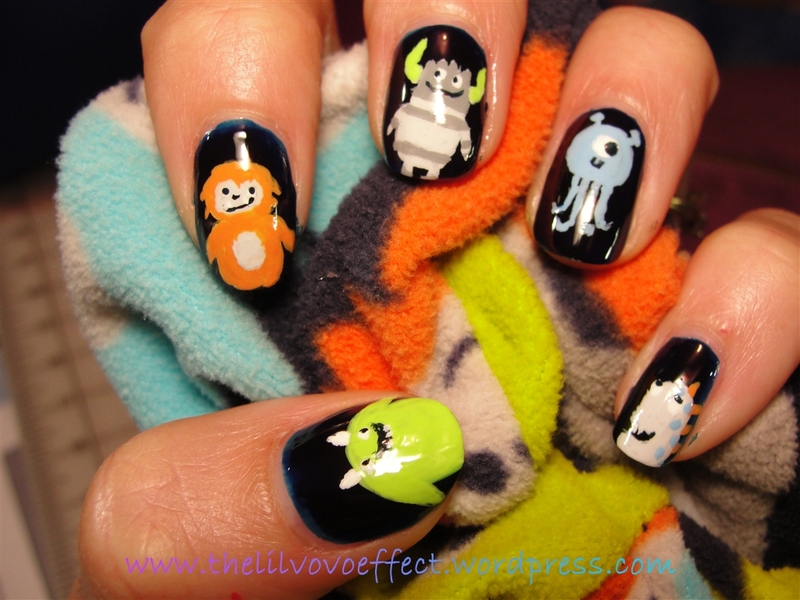 I used acrylic paint for the characters so I wasn’t sure how a regular matte top coat would work. I had planned form the beginning to wear it as matte because that’s how the p.j.’s look- fuzzy! But I didn’t feel like that was the time for experimenting and did SH Insta Dri and then Hard Candy Matte-ly In Love. IMO the matte does look best! Lately I’ve been really wanting to get some polishes from Orly. Probably because I’m not supposed to be buying anything still and also because I don’t own even ONE! Sad I know. SO I started looking at lots of Orly’s that I thought I might like to buy…someday. And Space Cadet was one I was like “OOooooo Ahhhh!” and then found out it has a 100% dupe- that I already own. I hate kicking myself later when I realize I bought something that technically is just a different bottle with a different name and brand. So I giddily pulled it out and put it on like I just bought it- because I’ve never worn it before then! I told my hubby about this “shopping in my own stash” and he looked at me like I was nuts…Ha…ha…ha. Anyways onto the swatches- I doubt anybody reads this part anyways. 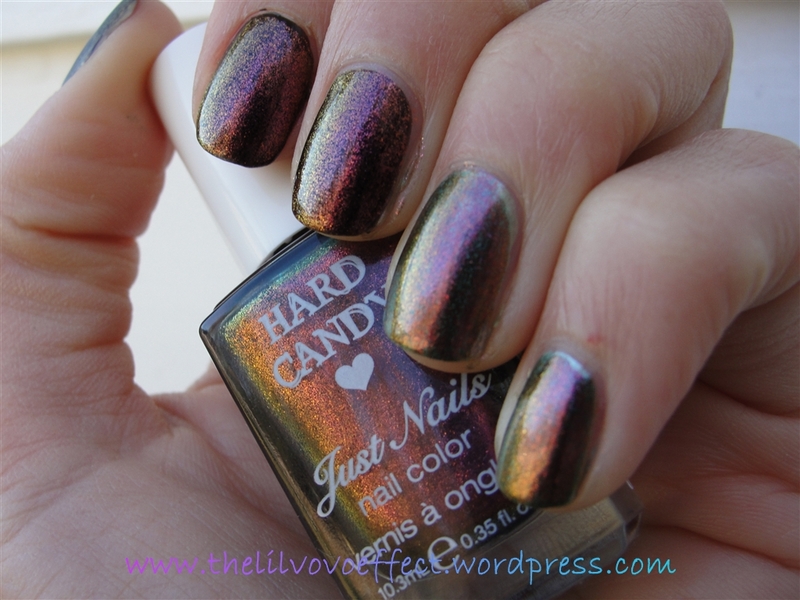 So here is Hard Candy Beetle dupe for Orly Space Cadet. Hard Candy Beetle, is in two coats over black polish on index and middle and over metallic green on ring and pinky. I don’t think I could be happier with how these pictures turned out. Most color shifting polishes are a PITA to picture, but this one apparently loves me. To me I usually see the colors yellow and red with this, and I believe there is some orange and gold maybe some purple to it. You can build it up even more if you desire. I did the green because this polish has a deep murky green base to it. you can barely notice the difference and if I did a coat or two more I don’t think you’d be able to tell at all. Wow…looking at that title is just seems like something nasty! But whatever! My NOTD is for both HANDS because they’re different. For some reasone I very very very very very rarely, and purposefully try not to, have matching hands. For some reason it drives me nuts. It doesn’t bother me at all on other people- just me. It’s literally like *looks at left hand* ‘Ohhh pretty.” *Looks at right* “WHAT THE HECK?!?! O.O” All surprised and stuff like the world is coming to an end. Loose screws- I know. Also I’m getting pretty good at picturing my right hand because I am a righty! So yea sorry about my purple thumb I have this ongoing split and I can’t stop picking at it and the nail polish did no want to cover that with 3 coats. I know the ombre effect is now a old trend but I’m trying to catch up and I still like the looks of them. I also could have did better I think color wise but surprisingly this is all that would work with certain colors being a must have together and then wedging in a few “odd” colors IMO. I don’t think index purple is in place. Too bright. And alot of the blues dried very similar…shaded yes but almost “too close”. I will try this again with different colors! So HOPEFULLY I can remember what all of these where. And yes I know I might have made it seem like I was doing very different stuff but that phase is still alittle experimental right now. From left to right. Wnw Black Creme, Sation Oh My Oceania, Sinful Colors Lavender, Sally Hansen Blue It, all with one coat of Pure Ice Heartbreaker. I love this, it really makes things pop. My favorite combo is over the purple, it fills a void for a purple with blue/green shimmer. There’s really not much to say about this because as you can clearly see- it’s awesome. Barely noticable over some of the already shimmery polishes, but I think any creme will dazzle with this over it. Makes OMO look more like I was hoping it would be. So I have to admit that I got this one in particular because of Robin from robinmosesnailart on YT. She showed this in I don’t know what tutorial but when she said the name and cracked up so did I. Also when I found out that this was a yellow jelly I knew I had to have it. Trying to amass as many jellies as I can. Sation You Butter Tell Me in 3 coats is super sheer. I love that this seems to brighten the white parts of my nails! I put the first pic in because I believe it to be a bit more color accurate then the second. The second one seems to lean a bit more green like a highlighter yellow-but it really is a yellow. Probably one of the easiest jellies I’ve worked with. Dry time is decent. So what do you think? Anything?